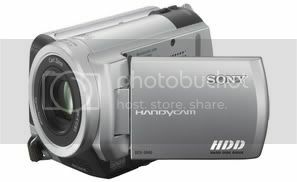 The Sony DCR-SR40 digital camcorder incorporates a 30GB hard drive and provides battery up to six hours and features a 2.5-inch (4:3 ratio) LCD monitor with touch panel. The Sony SR40 includes a Carl Zeiss Vario-Tessar lens, capable of up to 20x optical zoom. The camcorder offers up to 20 hours of recording in long play mode and more than seven hours in high quality mode and features Sony’s HDD Smart Protection system. The Sony DCR-SR40 comes supplied with the Handy-cam Station enabling easy connection to computer, television or DVD recorder via the included USB, AV and DC-in cables. The Handy-cam Station also features Sony’s One Touch DVD Burn button which can automatically burn video straight to DVD via a computer. The DCR-SR40 should be available from September 2006 for the expected retail price of around $600 (USD).